The “228 Tâi-uân-sîn Taesiong Scripture” is a book of modern scripture scripted on A.D. 2004 February 28th. It’s a revelation for the people of Taiwan from God through the great deeds of people sacrificing their lives in upholding freedom, democracy, human rights and rule of law. 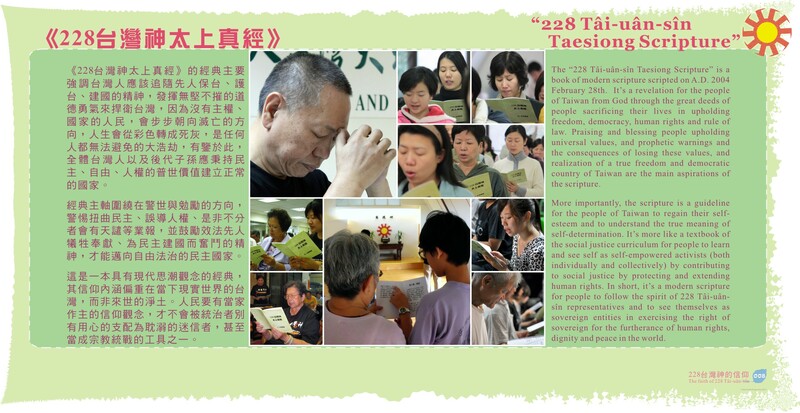 Praising and blessing people upholding universal values, and prophetic warnings and the consequences of losing these values, and realization of a true freedom and democratic country of Taiwan are the main aspirations of the scripture. 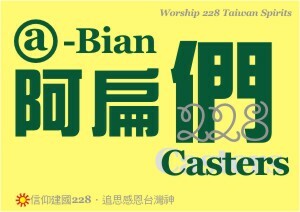 More importantly, the scripture is a guideline for the people of Taiwan to regain their self-esteem and to understand the true meaning of self-determination. It’s more like a textbook of the social justice curriculum for people to learn and see self as self-empowered activists (both individually and collectively) by contributing to social justice by protecting and extending human rights. In short, it’s a modern scripture for people to follow the spirit of 228 Tâi-uân-sîn representatives and to see themselves as sovereign entities in exercising the right of sovereign for the furtherance of human rights, dignity and peace in the world.